You can change the size of messages in the Reading pane for a single message or for all received messages by using the Zoom feature. Click the percentage to the right of the Zoom slider to open the Zoom window, located at the bottom right of Outlook. 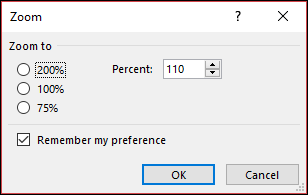 Select one of the default options or enter a specific percentage number. To apply this zoom level to all messages, check the Remember my preference check box and then click OK.
Use the slider at the bottom right of the Reading pane to adjust your zoom level. As you adjust, the text size in the Reading Pane will increase or decrease.